Six-time defending champions India suffered a three-wicket defeat against Bangladesh in the final of the Women’s Asia Cup Twenty 20 cricket tournament at the Kinrara Academy Oval here on Sunday. After India scored 112/9, thanks to Harmanpreet Singh’s 56, Bangladesh managed to get over the line in the final ball of their innings. Bangladesh were in control for the major part of the match. Even after Nigar Sultana (27 off 24) got out in the second ball of the 16th over, when Bangladesh were 83/4, Rumana Ahmed (23 off 22) did well to bring down the required runs to 13 off the last two overs. In the penultimate over, Deepti Sharma gave away only four runs, keeping India in the match. In the first three deliveries of the final over, delivered by Harmanpreet, Bangladesh got six runs, including a boundary from Rumana. Harmanpreet made it a pulsating affair by removing Sanjida Islam (7) and Rumana — a victim of run out, in the fourth and fifth deliveries. Rumana was stopped from reaching for her second run in the penultimate delivery, meaning Bangladesh needed two runs from the last ball. Jahanara Alam scampered for two runs off the final ball to seal Bangladesh’s first title in the continental championship which had seen India winning every title since its inception in 2004. Bangladesh had earlier in the week defeated India by seven wickets — which was their first win over the sub-continental giants in any format. 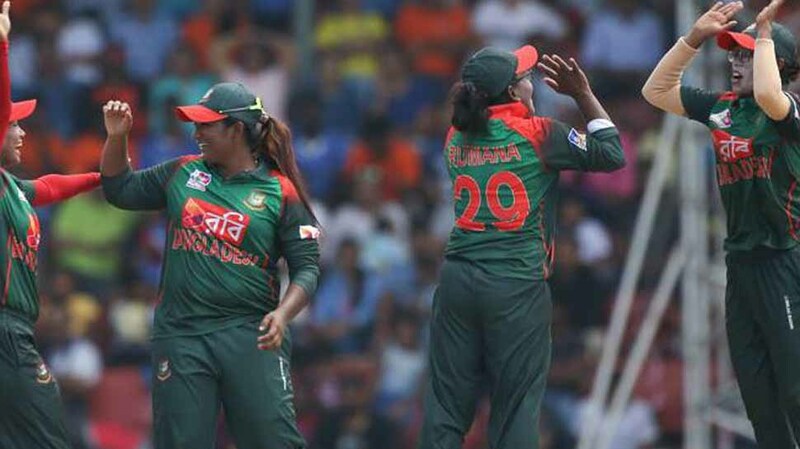 In the final, having elected to field, Bangladeshi bowlers justified their captain Salma Khatun’s decision as they reduced India to 32/4 in the first nine overs. Salma effected a run out of opener Smriti Mandhana (7) in the first delivery of the fourth over before right-arm medium pacer Jahanara Alam rattled the stumps of Deepti Sharma (4) in the seventh over. In the following over, off-spinner Khadija Tul Kubra dealt a huge blow to India by removing veteran Mithali Raj (11). In another quick shock to India, Anuja Patil (3) was declared out for obstructing the field in the second ball of the ninth over. Then the fifth-wicket stand between Harmanpreet and Veda Krishnamurthy (11) lasted for 30 runs till Salma accounted for the Karnataka right-hander in the third ball of the 13th over. Afterwards, Harmanpreet dominated the bowlers, who kept getting one wicket after the other. India were reduced to 74/7 as Taniya Bhatia (3) and Shikha Pandey (1) fell even as Harmanpreet held one end. She found good support from Jhulan Goswami (10) as the eighth-wicket stand between them fetched 33 runs. India managed to score 112/9 as Harmanpreet was the last player to be dismissed in the final ball. The Punjab right-hander hit seven fours during her 42-ball innings. Defending the small total was expectedly tough for India. Leg-spinner Poonam Yadav kept India’s hopes alive by removing Shamima Sultana (16), Ayasha Rahman (17) and Fargana Hoque (11) in a hostile spell. Rumana and Nigar joined hands at 55/3 before the duo took Bangladesh near the target.